Trumpet player Johnny Claes was born in London in 1916. His father was Belgian and his mother was Scottish. He toook trumpet lessons from Nat Gonella and by 1935 was working at the Nest Club in London and in 1937 recorded with Gerry Moore for Decca in 1937. He then played in various bands in various European countries including Switzerland, Holland and Belgium. While in Holland in 1937 he played in The Coleman Hawkins Band from August to September. He returned to the Boogie Woogie Club in London from March to August, 1940 and then, from August, 1940 to February, 1941 he was with the Teddy Joyce Orchestra. In May 1941 he formed his first band and subsequently led a band for various periods until the end of 1945. Carlo Krahmer became deputy leader and started to play the vibraphone seriously, a unique step for a bliind musician. Soon every set played by the band contained one solo spot played on a huge three and a half octave vibraphone Carlo had acquired. The bands were notable for the number of high quality future modern jazz musicians that were employed. These included, amongst others, Tommy Pollard, Denis Rose, Norman Stenfalt, Ronnie Scott, Harry Hayes, Aubrey Frank, Pete Chilver and Kenny Graham. After a few one nighters in southern England in September, 1945 Johnny Claes disbanded for the last time and returned to the family business in Brussels. He ran The Esquire Club in Blackenburg and wrote for the Belgian Jazz Hot magazine. In 1948 he took up professional motor racing and between 1950 and 1955 competed in 23 Grand Prix. He was a popular and under-rated driver but died in Belgium in 1956 whilst awaiting an operation for cancer. Other sources suggest that he died from TB. Bill Barker was pianist in the band in 1945 and his son Clive says that the band appeared in a George Formby film made in 1946. Titled "George in Civvy Street" the whole band are shown and Bob Barker plays piano-accordion in some scenes with George. Since Johnny Claes had disbanded in 1945 it would appear that the band reformed fo the film or possibly those sequences were made in 1945. "I was about sixteen when I did an audition for the Johnny Claes Band. The thing was I couldn't read - never been much of a reader. I couldn't really play jazz to any degree. Johnny was very nice to me, he said ' we really need someone who can read which was a nice way of putting it because I just couldn't play. Johnny Claes (tp), George Chisholm (tb), Jimmy Williams (cl), Reg Dare (ts), Gerry Moore (p), Jim Reid (b), Ben Edwards (d). Oh Lady Be Good*/Honeysuckle Rose*#. "JOHNNY CLAES DISCOGRAPHY AND BIOGRAPHY"
March to May, 1941 The first band engagement was at the Beach Underground Club in London under the title Johnny Claes and his Band The personnel was: Johnny Claes (tp,dir), Dave Wilkins (tp), Rube Stoloff (tb), Reg Owen, Reggie Dare, Spike Hornett (ts), Hetty Booth (p), Charlie Short (b), Carlo Krahmer (d), Benny Lee (vocals). On March 27th the band recorded I Got Rhythm with a vocal by Benny Lee and other titles at the Star Sound Studios. These were private recordings and were never issued commercially. At the end of March Reg Owen and Hetty Booth were replaced by Freddy Grant (ts) and Art Thompson (p). During this period the band made a number of film shorts for Pathe. May to August, 1941 the band was at the Montparnasse Club in London as Johnny Claes and his Band The personnel was: Johnny Claes (tp,dir), Dave Wilkins (tp), Rube Stoloff (tb), Gerry Alvarez, George Harrison (as), Reggie Dare, Spike Hornett (ts), Art Thompson (p), Charlie Short (b), Carlo Krahmer (d), Benny Lee (vocals). During this engagement Dave Wilkins and Rube Stoloff left and were not replaced. Harry Hayes (as), Aubrey Frank, Andy McDevitt (ts), and Doreen Villiers (vocal), worked with the band. August to September, 1941 the band, now reduced to a quintet, was at the Cotton Club in London as Johnny Claes and his Clae Pigeons. The personnel was: Johnny Claes (tp,dir), Gerry Alvarez, (saxes), Tommy Pollard (p), Charlie Short (b), Carlo Krahmer (d). In August, 1941 the larger version of the band recorded a BBC Forces programme for Radio Rhythm Club and also appeared in a Jazz Jamboree at the London Palladium on September 7th, 1941. Sunday, September 7th, 1941 the band performed at the London Palladium in a Jazz Jamboree. Besides the leader there were ten other musicians plus a vocalist. The personnel was: Johnny Claes (tp,dir), Geoffrey Gilbert (fl), Harry Hayes, Gerry Alvarez, George Harrison (as), Andy McDevitt, Aubrey Franks (ts), Tommy Pollard (p), Charlie Short (b), Ivor Mairants (g), Carlo Krahmer (d), Benny Lee (vocal). circa September to October, 1941 the band, was at the Nuthouse Club in London as Johnny Claes and his Clae Pigeons. The personnel was: Johnny Claes (tp,dir), Gerry Alvarez, (saxes), Derek Neville (as,bs), Tommy Pollard/Norman Stenfalt (p), Charlie Short (b), Carlo Krahmer (d), Doreen Mann (vocal). Norman Stenfalt replaced Tommy Pollard sometime in this period. There is a suggestion that Johnny Claes replaced Nat Gonella for a Columbia record date by Gonella's New Georgians on September 26th, 1941. Gonella was by now in the Army. circa late November, 1941 the band took part in a feature film called Escape to Justice. The film was made by Piccadilly Productions and Johnny Claes and his band appeared in a night club setting. Johnny Claes had a small acting role. circa early December, 1941 the band made a twenty minute film short called Happy Rhythm, again for Piccadilly Productions. The on screen musicians were: Johnny Claes (tp,dir), Frank Weir (cl,as), Gerry Alvarez, (ts), Derek Neville (as,bs), Unknown (ts), possibly Alfie Kahn (ts), Norman Stenfalt (p), Ivor Mairants (g), Unknown (b), Carlo Krahmer (d). The band played a number of one night stands in December 1941, including Ilford Town Hall on December 10th, 1941. The band now had five saxes plus rhythm with just Johnny Claes on trumpet. The vocalists were Irene King and Benny Lee. This was Johnny Claes' third and final recording session for Columbia. (*FB2765 other titles on FB2774(or 5). *Chattanooga Choo-choo (vocal BL)/*Nobody Knows The Trouble I've Seen (vocal BL)/Watch The Birdie (vocal IK)/The Whistler's Mother-In-Law (vocal BL). January to early August, 1942 the band appeared at the Panama Club, and the Cuba Club as well as broadcasting for the BBC Home Service for the Forces and on BBC Radio Rhythm Club. The personnel varied regularly, Keith Bird, clarinet, came in and Tommy Pollard and Bernie Fenton, both future Club Eleven pianists, had spells with the band. Kenny Graham, Coleridge Goode and Lauderic Caton were other top jazz musicians who made their mark in the band. mid August to early October, 1942 the band, was at the Embassy Club in London as Johnny Claes and his Clae Pigeons. The personnel was: Johnny Claes (tp,dir), Gerry Alvarez, Dougie Robinson (as), Kenny Graham, George Harris (ts), Bernie Fenton (p), Lauderic Caton (g), Coleridge Goode (b), Carlo Krahmer (d), Billie Campbell (vocal). From late September to early October, 1942 Johnny Claes led his Clae Pigeons on a short British tour entertaining American troops. Following this tour Claes broke up the band. The war was making it impossible to keep a band going, not only were there fewer gigs available but musicians were being called up for war service. The personnel for the tour was: Johnny Claes (tp,dir), Gerry Alvarez (as), Kenny Graham (ts), Bernie Fenton (p), Lauderic Caton (g), Coleridge Goode (b), Carlo Krahmer (d). 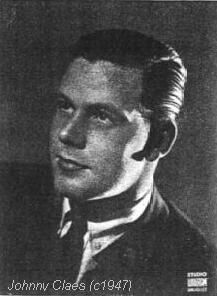 During December 1942 Johnny Claes made a series of six programmes for BBC Forces under the title of Tea and Trumpets. They were fifteen minutes long and were shown at weekly intervals at 5pm on Thursday afternoons through December and into January 1943. The group was listed as Johnny Claes and his Rhythm Sectionand the personnel was: Johnny Claes (tp,dir), Tommy Dummar (p), Lauderic Caton (g), Teddy Wadmore (b), Bobby Richards (d). From January 9th to March 31st, 1943 Claes reformed his band for an engagement at the Astor Club in London as Johnny Claes and his Band. The personnel was: Johnny Claes (tp,dir), Jackie Bonser (as), Frank Freedman (ts), Tommy Dummar (p), Lauderic Caton (g), Reg Davis (b), Bobby Richards (d), Billie Campbell (vocal). During the period of this engagement Claes took part in a couple of radio broadcasts - one with a band with two violins, another a quintet with a vibes player and two guitars. The next long term engagement was from April to November, 1943 at the Potomac Club and from May, 1943 the band doubled at the Princes Restaurant as Johnny Claes and his Clae Pigeons. This was with a smaller band than usual and the personnel was: Johnny Claes (tp,dir), Reggie Dare (ts), Barry Mills (p), Frank Deniz (g), Maurice Leslie (b), Tony Lytton (d), Billie Campbell (vocal). Work seems to have dried up after this booking although the band may have taken part in a feature film Star for a night in mid 1943, but other bookings seem meagre although Tommy Whittle (tenor sax) and Denis Rose (trumpet) played on some gigs during the summer of 1944. For the month of September, 1944 the band were resident at Neales Ballroom in Coventry as Johnny Claes and his Clae Pigeons. The personnel was: Johnny Claes (tp,dir), Denis Rose (tp), Ronnie Chandler (as), Gerry Alvarez (as,bs), Tommy Whittle (ts), Jimmy Henney(?) (p), Roy Dexter (b), Freddy Crump (d), Billie Campbell(?) (vocal). On Saturday 30th September a BBC Saturday night at the Palais programme was broadcast on the Home Service from 11pm to midnight. In early October, 1944 Ronnie Scott replaced Tommy Whittle. A residency from October to early December, 1944 followed at the Gliderdome in Boston, Lincs. as Johnny Claes and his Clae Pigeons. The personnel was: Johnny Claes (tp,dir), Denis Rose (tp), Ronnie Chandler (as), Gerry Alvarez (as,bs), Ronnie Scott (ts), Jimmy Henney (p), Roy Dexter (b,vocal), Freddy Crump (d). In March, 1945 another bebopper Terry Brown replaced Denis Rose and the band did a series of one nighters around southern England, returning to the Gliderdome from late April to late May, 1945. In July 1945 the band appeared in a feature film George in Civvy Street starring George Formby and played one title Mop Mop as well as miming to some incidental music and having minor acting roles. Johnny Claes (tp,ldr), Denis Rose (tp), Ronnie Chandler (as), Ronnie Scott (ts), Gerry Alvarez (as,bs), poss. Jimmy Henney (p), Roy Dexter (b), Freddie Crump (d) + George Formby. This was the recording debut of Denis Rose and Ronnie Scott. Johnny Claes (tp,dir), Terry Brown (tp), Gerry Alvarez (as,bs), Ronnie Scott, Dennis Hughes (ts), Bill Barker (p), Roy Dexter (b), Freddie Crump (d). Chelsea Bridge (unissued)/C Jam Blues (unissued). Ralph Sharon and Roy Willox played on some gigs in 1945 and Ronnie Scott left the band at the end of August, 1945. After a few one nighters in southern England in September, 1945 Johnny Claes disbanded for the last time and returned to the family business in Brussels. He ran The Esquire Club in Blackenburg and wrote for the Belgian Jazz Hot magazine. In 1948 he took up professional motor racing and between 1950 and 1955 competed in 23 Grand Prix. He was a popular and under-rated driver but died in Belgium in 1956 whilst awaiting an operation for cancer. Other sources suggest that he died from TB.